"The Mount Beacon Incline was an unqualified success from its opening in 1902 until the late 1920’s…"
While the rails may be silent now, thousands of passengers annually travelled the 2,200 feet up that historic mountain. Built during the cold of a Northeastern Winter, the breadth of human innovation, grit of man’s endurance and scope of our own determination was on full display – yes, they reached the summit and what followed was a legacy of success and trial. I am reminded of an old adage: "If you don’t know where you’re going, any road will get you there." One hundred and ten years ago those who called this county home stared up at the mountain that once served as an early warning system, a beacon, for General George Washington and the Continental Army during the American Revolution – knowing the challenge and believing in their abilities, they knew where they were going and they got there. We come together tonight in one of our two great cities – Beacon – where we, too, stand before a mountain of enormous proportion. The fifth year of a national economic recession, joblessness too high, budget constraints and limits on our resources are real, demands for services are growing – problems are complex, interests are diverse, challenges are great. The state of our county is being challenged, but we possess the same spirit that brought those innovators and laborers, poets and historians, visitors and proud Dutchess County residents to the peak of this city’s namesake in 1902; the same resilience that will bring us there again! Ease of access to the Hudson River has defined our county’s growth and prosperity for, well, hundreds of years. This majestic river, along with rolling hills and fertile soils made communications easier, agriculture successful and our community a great place to live, work and raise a family. Our ingenuity, vision and strong community fabric have brought us distinction and, in many ways, made us a model emulated by others across the state and nation. Over the last 20 years our resilience has been evident…. These are just a few on the extensive list of great things we have accomplished as a county. The last two, however, hold an important place in my early experience as County Executive. Sadly, I witnessed firsthand the critical role each played in the fire on Fairview Avenue in the Town of Poughkeepsie - a tragedy that took the lives of three young college students. We joined as a community and mourned their loss. So, too, do we embrace their lives, support their loved ones and strengthen our community. On that day, and in the days that followed, we witnessed the compassion and decency of Marist College, Dutchess Community College and our County as a whole. Importantly, at the scene we saw the dedication and professionalism of our emergency responders. Seamlessly, career and volunteer, law enforcement, fire and rescue from multiple agencies and our own Fire Investigation Team all responded without ego or pretense. As these men and women do on countless occasions across our county, they did their jobs, sought no attention and returned to their families. As with any tragedy, those lost shall always be first in our thoughts and prayers. But never forgotten must be these career and volunteer heroes. We are grateful to them, and for the investment our community has made in training, tools and resources that allow them to respond so effectively to such horrific circumstances. With all the professionalism and compassion she can muster our County Medical Examiner Dr. Kari Reiber does her best – but I have witnessed firsthand how difficult it can be for family having to identify loved ones in the current inadequate conditions. While we cannot prevent the pain and grief felt in the wake of such tragedies, we can – and thanks to the Legislature’s approval last year – we will ensure a state-of-the-art, professional facility where families can begin their grieving process with the dignity they and their loved ones deserve. I know I can speak for the Sheriff and District Attorney, Emergency Response Coordinator Dana Smith, Commissioner of Health Dr. Michael Caldwell, Dr. Reiber, Legislature Chairman Rob Rolison and all my colleagues in this county government when I say we must, and we will, continue to ensure our emergency responders have the necessary resources to provide for the public safety and their own safety so that they may return home to the comfort and care of their families. The effects of this prolonged economic stagnancy linger on as too many Dutchess County residents continue to struggle with job loss, underemployment and other issues brought on by the stress of a stubborn economic recession. 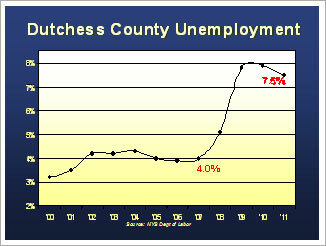 Unemployment in Dutchess County for 2011 was 7.5% compared to 4% in 2007, with 4,400 fewer people employed. Demands on our health and human service agencies increase as too many families continue to struggle. Homeowner applications for the Home Energy Assistance Program (HEAP) have increased by more than 67% to nearly 3,100 compared to 1,850 in 2007. The Department of Mental Hygiene’s 24/7 HELPLINE saw an increase of nearly 62% in calls for assistance from 16,000 in 2007 to almost 26,000 in 2011. Again, the stress, pain and hardship are taking its toll on Dutchess County families. Total Department of Social Services caseload for public assistance programs exceeded 43,000 as compared to the 28,000 for the same period in 2007. This is a dramatic increase of more than 15,000 unduplicated cases. Our families and the services they demand are being stretched to the breaking point. Medicaid remains the single largest mandated program for county government, and is the number one mandate relief priority for counties across the State. The 2012 adopted county budget appropriates more than $41 million of your hard earned tax dollars, consuming almost 40% of our county’s property tax levy for this one program. Over the past three years, counties received temporary federal stimulus funds (FMAP) to offset the cost of the state mandated Medicaid program. This temporary relief ended last June leaving a budgetary gap to be filled. State mandates challenge county government budgets and leave fewer county dollars for local services such as road maintenance and snow plowing, emergency response and law enforcement, veterans’ services, youth programs, park facilities and other programs important to our residents. In a recession, the demands for services coupled with state mandated programming present daunting challenges for county government especially when resources and revenue are limited or restricted all together. 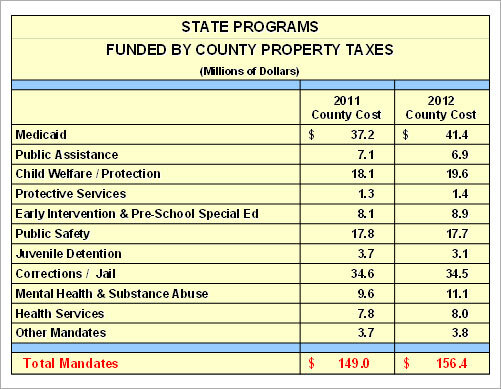 Sales tax in 2011 paid for nearly 33% of county government spending with 25% funded through property taxes, 25% through state and federal aid and the remaining 17% other revenues. In a recession, economically driven revenues such as sales tax, interest earnings, and others are stagnant. Additionally, for the fourth consecutive year, we are confronted with a decreasing county tax base. 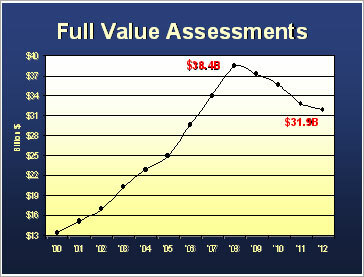 Our 2012 true value assessment is 17% lower or $6.5 billion less since 2008. This is a $6.5 billion loss in the tax base – that’s reductions in home values, losses in the commercial construction market, farms ceasing to operate, storefronts closing and a deterioration of the very underpinnings of our economic condition. With the tax base shrinking and revenue sources dwindling, counties shouldn’t have to turn to already overburdened property taxpayers. Of course, in 2011 the state passed the strictest property tax cap in the nation. When it did, many of us argued for immediate and partnering mandate relief. Too many didn’t see the need. In fact, sadly, the majority in the house where I once served barely came to the table. Well, the tables have indeed been turned. In his 2012-2013 budget proposal, Governor Andrew Cuomo begins to "right the ship of state," embracing several of the relief proposals we on the Mandate Relief and Redesign Team and New York Association of Counties (NYSAC) champion. Dutchess County government is ready to partner with the Governor and advocate for this much needed reform. I am equally confident my former colleagues – Senators Steve Saland and Greg Ball, Assemblymen Joel Miller and Steve Katz will keep up the fight and we will stand with them to make good on the second half of this "tax cap promise." And to those who seek the support of voters on March 20th – the taxpayers of this county will be watching. Either you stand with us, or you stand with an Assembly majority that has time and time again shifted the cost of their spending onto the backs of property taxpayers. And, we will not accept it any longer. Make use of fund balance, the County’s “safety net” to fill the budget gap. None of these options are desirable, but they are, however, what have been forced upon us. All have profound and lasting effects. While serving as Mayor of Tivoli, I recall being told that decisions made out of desperation are generally destructive. With no reasonable alternative, the 2012 budget appropriates $24.3 million of the year-end audited general fund balance of $29.9 million to pay for the core services our residents expect. This application of fund balance, coupled with the additional drawdown of $3 million during 2011 and other potential projected revenue shortfalls or unforeseen emergencies, could leave county government with NO un-appropriated fund balance when the 2011 books are closed. 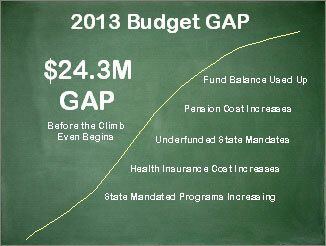 Yes, with a significant 2013 budget gap, virtually no available fund balance, underfunded state mandates, increases in pension, health insurance costs, a property tax cap and economic decline, we are staring up that steep and overwhelming slope. Who are we as a people and how do we hope to live? How we confront this perilous frontier will help us answer those questions and define for future generations the county they call home and government they inherit. And, like too many households we are faced with a challenge of enormous magnitude. It will be necessary to make difficult sacrifices, but, in 2012, the state of our county is not a fixed destination, but rather the difficult journey we embark upon together. Just as John Winthrop offered in his 1630 sermon aboard the ship Arbella, echoing the ‘Sermon on the Mount,’ to the future Massachusetts Bay colonists, "We must always consider that we shall be as a city upon a hill – the eyes of all people are upon us." Yes, the eyes of many are upon us. The welfare of so many relies on us. Tonight, we reset our expectations and relentlessly commit ourselves to core principles that will help us problem solve, filter our decision making and mold consensus. These will serve as checkpoints to make certain we are on the right course and ensure we govern and serve with professionalism, respect and diligence. Focus: County government cannot be all things to all people, so we must prioritize, set aside personal or political agendas, confront challenges because we should lead with less delivering a smaller, smarter and more successful government. Inclusion: We will engage stakeholders in decision making, empower residents and other business, community and elected leaders to participate in a robust and civil discourse in order to mold consensus. Importantly, we will listen. Good ideas and great volunteers will always be embraced. 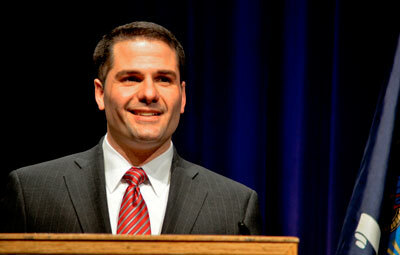 We will seek to redefine democracy, and earn the trust and maintain the confidence of those who call our county home. Logic: Do what makes sense. A practical approach to problem solving will save time, energy and resources. We will conduct the necessary analysis, outline the viable options, establish expected outcomes and make decisions supported by facts. Fairness: Compassion and civility in our discourse is no weakness. We must concern ourselves with the individual while acting for the good of the whole community. We must look out for the best interest of those we serve. Overall, we will consider the economic benefit or impact of every decision and how our actions, when these principles are applied, affect our shared quality of life. We work for the people! The single most critical responsibility of the County Executive is the preparation and oversight of county’s annual operating budget. Responsible fiscal stewardship in a democracy requires clearly defined measurable expectations, thorough communication, continued education and ongoing stakeholder involvement. Dutchess County’s most important asset is our people: the families, young people, seniors, veterans, business owners, farmers and countless volunteers who call Dutchess home. It is vitally important we listen to each other and provide opportunities to identify needs, establish goals and set priorities. We want a community engaged in a civil, robust dialogue answering the questions that confront us and offering ideas and input so we have shared investment in the results of our decision making. In the coming months, you will witness a county government engaged in community dialogue unlike anything we’ve seen before. Relying on the talent at our county’s Office of Computer Information Systems (OCIS), we will expand our presence on social media, enhance access to the county website, implement online citizen surveys and host public forums around the County to gain informed input from residents and community stakeholders. Our goal is simple: We work for you and we want to hear from you. Help answer those questions, assist in enhancing programs and service delivery, and participate in identifying cost reductions. We welcome your involvement in establishing priorities and debating policies. Those who serve with me in the Administration have already begun to implement enhanced outreach efforts and they will do more to generate public involvement and provide assistance and answers to our fellow elected officials. In March, we will provide county legislators, elected officials, department heads and county fiscal staff with educational budget sessions focusing on process, structure and format, goal and priority setting, programmatic budgeting, outcome measures and best practices. These sessions will provide insight into the budget process, as well as tools to assist participants with their roles in that process. We are a team and we will govern as a team. Beyond the broad budgetary controls we have already implemented, we will form a new Fiscal Accountability and Strategy Team (FAST) to evaluate county government spending, financial policies and processes, seek greater efficiencies and identify opportunities to further consolidate government. The FAST team will include personnel from the Budget Office, Department of Finance, OCIS, County Comptroller’s Office and other key departments. All of these steps are meant to bolster our budget process and ensure greater accountability in how taxpayer dollars are spent – whether through a line-item appropriation or contract with a service provider, the public expects us to achieve outcomes with the expense of their money. Citizen participation, support and education for our decision makers, disciplined financial management, and an aggressive effort to seek greater efficiencies and consolidation will establish a more transparent, goal oriented budget process. In order to demand the greatest efficiency in the delivery of core services, expenditures will be evaluated based on performance and measurable outcomes; always considerate of the taxpayer. Every institution of government must, from time to time, be weighed and measured. The county’s financial team does tremendous work and I want to thank them tonight – our Budget Director Valerie Sommerville and her staff, Commissioner of Finance Pam Barrack and her staff, plus all the department budget directors and fiscal staff. I also commend my countywide elected colleagues for the financial management of their offices. And even how to shop on-line. 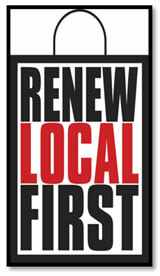 RENEW LOCAL FIRST at your DMV. Just remember, when you go to a Dutchess County Department of Motor Vehicles, 12.5% of that transaction stays right here. When you mail it to New York State or renew it online, Dutchess taxpayers get 0%. The County Comptroller plays an invaluable role auditing county expenditures and his involvement in our efforts is critical. Comptroller Coughlan your participation in several projects already under way has been very helpful, and while I might not enjoy the details of every audit conducted, we must all be open to responsible scrutiny. As we discussed, to enhance and improve our county airport’s business operations we will be evaluating multiple options and, as a major component of that analysis, your office will perform an audit of the Dutchess County Airport. This facility is a critical county resource and economic asset and we look forward to working with you throughout your review. Private sector job growth and sustainable economic development is the most critical component toward making smaller, smarter and more successful government. To that end, we will realign the economic development infrastructure in our county to meet this new economy head on. Our strategic economic development and job creation plan will address the continuing fiscal challenges, help rebuild our local economy and lead our county to greater economic stability, growth and prosperity. We will focus on business retention, expansion and attraction. Planned economic growth is as much about jobs and economic opportunity as it is about community revitalization, investment in our village and city centers, natural resource preservation and enhancement of our quality of life. The Department of Planning and Development has done phenomenal work over the years helping this county and our communities define their goals, and I commend Commissioner Kealy Salomon and her staff for their past and, I know what will be, their future successes. To enhance our work and add economic benefit to our expected outcomes we have created, in partnership with the County Legislature, the position of Deputy Commissioner of Strategic Planning and Economic Development. I am happy to officially introduce the Deputy Commissioner, Ron Hicks. Working together, Ron will launch our plan to reform, retain, reinvest and recruit: 4R Future. In order to further improve the business climate in Dutchess County, expand business, attract new businesses and create private sector jobs, we need the seamless coordination of our county departments and employees. Therefore, we will create the 4R FUTURE Economic Development Cabinet, comprised of existing county employees representing multiple departments. They will meet and communicate regularly, strategize on increasing efficiencies and improving services to our community, and most importantly, streamline the regulatory and permitting processes to ensure clarity, efficiency and predictability. This cabinet will reform the way Dutchess County works with our business community and responds to local governments. Whether it’s a deli in Amenia, hardware store in Rhinebeck, hotel in Poughkeepsie, or a chip fabricating plant in East Fishkill, County government must work for you. Numerous studies have concluded that as much as 80% of net new job growth comes from existing businesses. This is why we will have a coordinated focus on supporting businesses, large and small, already invested in our community. County government will bring together all existing external resources to ensure businesses in Dutchess County are aware of, and have access to, programs and services offered by the federal, state and local governments along with those offered by our not-for-profit community. These services include start up and small business counseling, micro-loans, government procurement, financial incentives, job training and educational seminars. Address those needs and barriers to ensure business survival and growth. The program will also monitor changing marketplace dynamics so that elected and government officials can make decisions meant to decrease threats or increase opportunities, and enhance community economic benefit. Rebuilding our economy and competing in this global economy, will take more than protecting the businesses we already have. To position ourselves for success in the future we need to be strategic about recruiting new development and investment. Last year Governor Cuomo and the State Legislature established 10 Regional Economic Development Councils across the state to compete for project funding. Of the $67 million awarded to the Mid-Hudson Region, Dutchess received just over $2.7 million or 4%. As the Governor launches the second and subsequent rounds, we will do better. 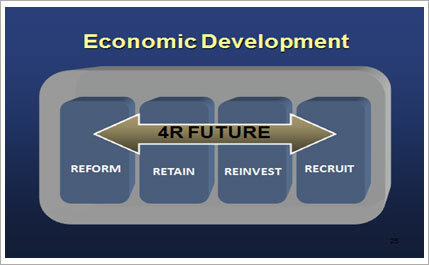 The first part of “REINVEST” is to establish a 4R FUTURE Working Group to identify transformative projects in the county that meet the Council's criteria, ensure that project applications are complete, submitted on time, and that Dutchess County and the Hudson Valley are the most competitive in the state. The second part of “REINVEST” is the establishment of two important efforts to give our municipalities the foundation and guidance to incorporate an economic development plan into their comprehensive plan and consider business improvement districts in their commercial corridors. The Strategic Economic Development Plan and Business Improvement District Facilitation will both be components of our planning and development efforts throughout the county. We must do all we can to attract NEW businesses to fill vacant industrial, office and storefront spaces, invest in our city centers and create job opportunities. Working with our Deputy Commissioner of Strategic Planning and Economic Development, the EDC will hire a business attraction specialist. Funded by the Dutchess County Industrial Development Agency and the External Marketing Council, this position will be dedicated to attracting new business to Dutchess County. We will also continue our partnership with the Hudson Valley Economic Development Corporation to develop and attract key industries: bio, data, distribution, and microelectronics - and we just recently launched a food and beverage industry cluster at the Culinary Institute of America. Coordinated planning and collaboration with key stakeholders will help us bring about comprehensive economic growth. Our efforts will require the application of all four of those decision making principles outlined earlier. We know this kind of partnership works – we know this kind of focus brings about results. We only have to look around us. It was the vision of entrepreneurs from New Hampshire, charmed by Mount Beacon’s rich history, natural beauty and amazing vistas. Partnering with local businessmen, the Otis Elevator Company engineered the railway and supervised the construction by the Mohawk Construction Company and Ramapo Iron Works. As spring broke in 1902 the marvel of their handiwork was revealed: 1,540 feet above sea level, an average grade of nearly 65% and for 800 feet a maximum grade of 74%. It was a modern marvel and amazing fete. A decade earlier and miles north, after three years of work undertaken by thousands, train engines first began steaming across the Poughkeepsie-Highland Railroad Bridge in January of 1889. The first of any bridge to stretch across the Hudson River, it was the longest in the world. During World War II, at peak use, 3,500 train cars carried America’s heroic troops across it every day. Then it was May 8, 1974. In his book "Bridging Hudson," Carleton Mabee recounts the day that ended its use as a rail bridge: "An hour after a Penn Central train with 100 cars crossed the bridge… a thick cloud of black smoke hung over the bridge. Wooden ties were smoldering and wooden walkways were burning, fanned by a moderate breeze." He goes on to write of the bridge’s demise. Of course, we know of its rebirth. Because of unyielding focus and amazing resilience, the Walkway Over the Hudson, at 1.28 miles, rose from the rust and ash to become the longest pedestrian bridge in the world. Collaboration and commitment led to the completion of the Walkway, and last month collaboration and commitment led to the purchase of the final remaining rail bed to connect the Dutchess Rail Trail with New York’s second most visited state park. Beginning at Morgan Lake and continuing west to the Walkway, this continuous paved trail will extend 25 miles from Hopewell Junction, through the center of our county, over the Walkway and westward to New Paltz, connecting with the Walkill Valley Trail for another 25 miles. Thank you Fred Schaefer, the Walkway organization, the Dyson Foundation, Senator Chuck Schumer and CSX for coming together to make this vision a reality. Dutchess County is completing phase four of the Dutchess Rail Trail, a joint venture with the New York State Department of Transportation, and we look forward to partnering with these organizations to build the last section of the Dutchess Rail Trail and connect it to create a world class recreational, economic and tourism asset of incomparable proportion. The construction of a high-speed 21 story elevator connecting the Poughkeepsie Waterfront to the Walkway is scheduled to begin this year. 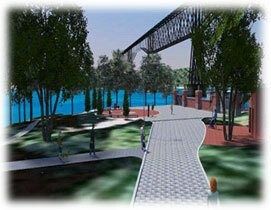 When all is completed, the economic benefit and impact to our shared quality of life will be unmatched. The City of Poughkeepsie has been undergoing a renaissance and the next chapter of its resurgence is upon us. As the county seat, we take particular pride in our role as a resident, neighbor and partner. Under the leadership of Mayor John Tkazyik, 14 key Hudson Riverfront stakeholders from Quiet Cove just north of Marist College to just south of the Bonura family’s Grandview will participate in developing a Hudson Riverfront Integrated Plan. Funded by the Dyson Foundation, coordinated by Dutchess County – this cohesive, collaborative approach will help redefine and make real the shared vision for Poughkeepsie’s shoreline. Just as the Walkway has propelled forward new economic potential, and we work together to develop a coordinated waterfront program, opportunities for revitalization will most assuredly reach surrounding neighborhoods, including Market Street. Building on the city’s Main Street improvements, shops, restaurants, office space and mixed use facilities create a new and dynamic atmosphere that draws new visitors and new growth opportunities. Poughkeepsie has a plan for Market Street, opening it to two-way traffic, enhancing pedestrian access and creating a streetscape that will inspire and attract new investment. Mayor Tkazyik has asked, and we have agreed, to coordinate efforts to bring this plan to fruition. Central to any Market Street revitalization is the county government campus – and key to our responsibility as a good neighbor is to address a county-owned building that has sadly become a blemish on us and this important corridor. 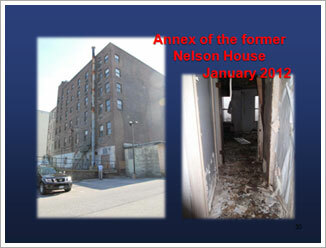 The annex to the former Nelson House is abandoned, it is a hazard and the seven figure cost to merely mitigate the mold is an indication that the Mayor is right: It is time for the County to work with the city to remove the building. For the twelve years I served as Mayor of the Village of Tivoli I came to work at the 1898 Historic Watts dePeyster Hall – I have the greatest appreciation for preserving and restoring our historic assets. We envision seeking private interests to remove and/or develop a new structure, keeping true to the historic nature of the property and architecture that once was the actual Nelson House. How we proceed has enormous impact. Doing so in a way that engages the private sector, can save tax dollars, meet future county and city needs, and help continue Poughkeepsie’s growth. We celebrate the successes and achievements here in Beacon and are excited to be an active partner in Poughkeepsie too. As we implement the "4R Future" strategic plan to realign government, coordinate with the private sector and assist businesses, we will also focus on the individual. Dutchess County has a diverse and dynamic workforce, but we must break down barriers to employment and further facilitate individual employment opportunities. Our young adults face the tightest job market in years. In 2006, there were 185 18-25 year olds receiving some form of public assistance. In 2011, more than ten times that number - over 1900 young adults received support. In this age group, there are four persistent barriers that can limit a person’s ability to obtain and sustain employment: daycare, training/job skills, transportation, and job resources such as uniforms or tools. In 2012, we will make use of block granted funds to partner with Dutchess County BOCES and the Dutchess County Regional Chamber of Commerce to provide a “STEP UP” program for clients to reach financial stability and independence. A mentor will work with each participant to develop a plan for any necessary daycare and resources and Dutchess County BOCES will work with individuals to evaluate job readiness and develop job skills with training to match available job placements. We will again partner with the Chamber, who will provide coordinated job matching and mentoring services including customized budgeting and goal setting. Please join me in thanking Charlie North, Frank Castella and the entire Chamber for this and their advocacy on behalf of Dutchess County’s business community. Accessing transportation can be one of the most difficult barriers to stable employment for individuals of all ages. Some have never learned to drive, while others who have difficulty maintaining a reliable vehicle. We will again partner with Dutchess County BOCES to help eliminate these transportation barriers. Women who have left domestic violence situations often face unique challenges finding employment, making their road to recovery an uphill battle, particularly if they have young children. Our economy is hard enough on too many; no one should have to overcome those challenges and an abusive relationship. So, I make this commitment: Dutchess County will stand beside these women. We will provide funding for daycare giving them the opportunity to secure housing and employment getting them further down their road to independence. By partnering with a service provider, we will provide a case manager to work with women in high risk, dangerous situations, and we will enable our new mobile crisis team to work together with law enforcement and our partner agencies to offer support and assistance to these courageous women. Breaking down barriers to overcome challenges and meet goals is not easy for anyone. It takes commitment, focus, and a coordinated effort to effect meaningful change. I am confident by collaborating we can provide a step up for our most vulnerable citizens, offer hope to those who need it most and ultimately, change lives. Our county government has long played a major role not only in the planning, coordinating and evaluation of mental health services, but in the service delivery as well. It is expected in 2012 that over 27,000 instances of care will be coordinated by our Department of Mental Hygiene in addition to an expected 26,000 Helpline calls. As a result of state aid reductions and a shift in the service delivery paradigm, the current system has become unsustainable. Delivery of Mental Health services was created and has evolved over decades that witnessed greater availability of non-county funds – before the tax cap, before budgets driven by growth in Medicaid costs, before the closure of our state psychiatric centers. As compared to other counties in New York, our model, in light of these changes in access to resources, has led us to a point where Dutchess is an outlier in New York State. Westchester County with three times our population spends $2 million less in local county tax dollars on mental health services. Erie County, with nearly three times the population spends nearly $7 million less. That said, Dutchess County has led the state in many ways when it comes to caring for those with mental health needs. Commissioner Ken Glatt and the employees of the Department of Mental Hygiene are to be commended – you are saving lives, providing help and dignity to so many. As Albany realigns how they fund mental health services, we must reconfigure our model to move toward the state approved Personal Recovery Oriented Services or PROS. This realignment was included in the adopted 2012 County budget. Physical and mental health is inextricably intertwined. Those with mental health or substance abuse conditions tend to have other co-occurring disorders. The thread of mental illness is frequently a contributing factor woven through other major personal and public policy challenges like inmate population, domestic violence, drug and alcohol abuse, and homelessness. This confirms the issues are not only important, but complex. It is not only about dollars and cents, but about coordination and integration. We must be inclusive. Not only considering discrete mental health services but including other supportive services like access to housing and transportation, employment assistance and even recreation. Overall we must make use of primary and preventive care and divert emergency room, hospital admissions, rapid re-admissions and incarcerations where possible and appropriate. Dutchess County must develop a rational approach to better integrate physical health with mental health as well as providing access to supportive services to reduce and prevent hospitalizations, homelessness and involvement in the criminal justice system. Our focus ought to create better outcomes, recovery for clients, support for families and the community at large. We have been particularly incentivized to provide leadership on this issue by the confluence of factors: Closure of the Hudson River Psychiatric Center, Medicaid Redesign, the Affordable Healthcare Act, behavioral health within managed care, returning veterans with Post Traumatic Stress Disorder, and now, thanks to our recent efforts and advocacy of State Senator Steve Saland, an additional $1.5 million in annual state funding has been designated for us to assist in making this logical transition to a new mental health delivery model. These funds will drive a coordinated effort to divert the mentally ill from hospitals, jails and homelessness by connecting them to direct services. We are examining our service delivery system and creating or developing those programs that appropriately meet the needs of the community in light of the changing infrastructure and funding streams within the Mental Health landscape. To assist in our effort, challenge our thinking and generate new perspectives, we are creating an external Health and Human Services Advisory Team. This team will be vested with the initial responsibility and challenge of providing an independent review of our proposed Diversion Plan. Dr. James McGuirk, Executive Director and CEO of Astor Services, will chair this Team. 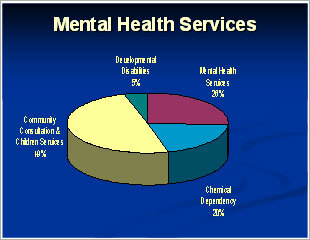 It will include broad representation from a number of other mental health and human service providers. I am thankful to those who have agreed to serve on this team, and I am pleased that the team will hold its first official meeting tomorrow morning. The staff liaison is our Acting Chair of the Health and Human Services Cabinet, Mary Kay Dolan. To effect change we will apply those principles I have outlined and add intelligent compassion to our decision making. We must evolve, but we will not waiver in efforts to set and achieve high standards of care, humane and compassionate treatment of clients and their families along with our employees, providers and the overall community. Dutchess County will continue to re-build a mental health delivery system that meets the service needs of the community within the context of the new funding reality. Dutchess County government and its Sheriff have a constitutional responsibility to incarcerate County inmates. Our Jail facility’s official capacity is 292 inmates yet in 2011 the daily population remanded averaged 417 with periodic spikes exceeding 450, forcing Dutchess to place inmates in facilities owned and operated by counties across the state at a cost approaching $5 million annually. These numbers are unprecedented and the current housing policy is unsustainable. The current cost and risk exposure to Dutchess County – its personnel and taxpayers – has reached critical mass, making it necessary to revisit our long-term, integrated criminal justice model as it pertains to inmate population. The work begun by the County Legislature’s Jail Study Advisory Committee and its Chairman Ken Roman is a commendable starting point. They have presented an initial framework within which we will focus our dialogue. To do this successfully, all stakeholders must be included in a system-wide decision making process to address short and long-term criminal justice issues. A systemic analysis team, led by District Attorney Bill Grady, will review the various system decision points during criminal justice processing, studying cause and effect while evaluating opportunities for efficiencies and potential improvements. A jail modeling team, led by Major Todd Gdula, will prepare inmate growth projections and look at various models, potential sites and their impact on costs, along with possible staffing cost reductions as part of new jail designs. This team will research other facilities to develop comparisons and supporting data as well as ideas for interim solutions to the housing-out problem. A “Special Populations” team, led by Acting Public Defender Tom Angell, will focus on the various types of inmate groups such as mental health, substance abuse, juvenile and women and their respective risk levels. They will evaluate how best to address each group from the time they enter the system, to incarceration and/or an alternative to incarceration, continuing through the re-entry process back into the community. This analysis will be extremely beneficial in identifying the quantity and types of beds needed to handle the complete population of inmates and individuals in other parts of the criminal justice system. A focused, inclusive, logical and fair effort should yield invaluable information enabling us to move forward with a strategy and a well-defined scope of service for consulting resources to design the needed elements for a complete and effective approach. Our next steps require an investment and commitment from all stakeholders – Sheriff Butch Anderson, Jail Administrator George Krom, District Attorney Bill Grady, local law enforcement, our judiciary, appropriate county departments, and community service providers including those in the mental health, domestic violence, and child welfare areas. We are grateful for your patience, participation and leadership. Throughout my years of public service, I have always believed in fostering responsible stewardship of our natural resources through the preservation of farmland and open space, development of smart land use policies, encouragement for every town in Dutchess to participate in our Greenway Compact, energy conservation and the use of alternative energy options. We have a duty to preserve our environment for future generations. 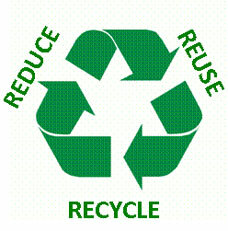 This commitment extends to greater awareness of waste disposal methods and recycling options. In 2012 we will focus on doing exactly that. Over two decades ago Dutchess County government made a decision to move away from land-filling garbage and instead utilized technology to convert our solid waste into usable energy. This method has operated for years in our County and provides us with an effective and environmental way to dispose of more than 100,000 tons of solid waste annually. We no longer have active landfills in Dutchess County and emissions from the waste-to-energy facility are well below the Environmental Protection Agency’s acceptable levels. In recent years, there has been considerable criticism of the facility and the overall management of solid waste related services. Part of the problem stemmed from not having anyone in county government tasked with the responsibility for solid waste management. In 2012, that illogic has changed. Last month, at the Administration’s request, the Legislature adopted a resolution designating Dutchess County as the planning unit responsible for development of the Local Solid Waste Management Plan (LSWMP). By reassigning this responsibility from the Resource Recovery Agency (RRA), a quasi-independent public authority established in the 1980’s to County government, those most accountable to the public will steer our broader recycling and solid waste policy. Create a better recycling system to track County volumes, establish a measurement process which sets targets and define a process for monitoring success. A key focus of this position will be to establish an education and awareness program for the public, municipalities and schools, all in an effort to increase recycling rates countywide. Investigate composting options and opportunities. This new focus will help us to logically achieve our solid waste goals through inclusiveness and fairness, creating economic benefit for county taxpayers, reducing the Net Service Fee and enhancing residents’ overall quality of life. Ladies and gentleman, the state of our county is the story of our struggle. The state of our county is the story of our successes. The state of our county is less about the destination and more about our journey and the steps we take together: one toward our future, one in the present and the ones that comprise our past. It is this history that built our communities, inspired our people and helped us define “who we are” and “how we hope to live.” How could we possibly scale the mountain before us, answer those fundamental questions or embark on the next journey without reaching back to our ancestors, summoning their wisdom and experiences, and relying on their inspiration and aspirations? Next year, Dutchess County will commemorate its 300th anniversary of democracy, when in 1713 the British Crown determined that the County’s population had grown large enough that they could select leaders of their own. On October 23, 1713 for the first time ever Dutchess County residents voted to elect a supervisor, treasurer, assessor — and of course, a tax collector. This past April the County Legislature voted to celebrate this milestone of democracy with a large-scale celebration. A similar celebration was held in 1983, to commemorate the 300th anniversary of the 1683 decision to create 12 counties, in the Province of New York. Our thanks to the Legislature for taking this action at the request of the prime sponsor Legislator Michael Kelsey, and our thanks to the Dutchess County Tourism Director Mary Kay Vrba, the Dutchess County Historical Society and local historians across our county for their efforts. You have a large task ahead of you, but you should not have to carry this responsibility alone, therefore, Dutchess County government will assist you, by immediately moving forward with the appointment of a County Historian. Further, we will restructure the Department of History moving it under the proven leadership of County Clerk Brad Kendall. As the Clerk is responsible for the archivist function of county government, this is a logical realignment meant to maximize our effort. In this vain, I will ask our County Historian to work with County Clerk Kendall to continue the preservation of our records, paintings and prints, and other historic artifacts, and expand the public places where we display our history. Every building lobby, elevator landing and entryway provide an opportunity to tell the story of our county, explain the experiences that got us here today, and remind us of the opportunities, beauty and potential that exists in every neighborhood, at every corner and around every table throughout our county. We have already begun this initiative on the 6th Floor of the County Office Building – the people’s floor – where I am honored to go to work and my colleagues in the Legislature consider public policy and debate the questions of the day. On this floor, as you enter the hallway you will note modest changes meant to welcome you to the place where we serve you. Soon the history of your county government will adorn the walls, the faces of those who helped us traverse the inclines of our past on display and the documents that have guided our decisions for generations available to review. It is here where we marry this effort with a second goal: To make County government a place where residents want to come to share ideas, where individuals and employees are welcomed and respected, and those we serve are always treated fairly. Yes, the hike up that mountain is strenuous and many eyes are upon us. There are peaks and valleys to overcome and challenges we cannot ignore. There is work to be done with a great deal at stake. Our task, however, is not to seek a single location to weather the storm. No, it is to stare up toward that beacon upon a mount and take the next step, trusting in our abilities, confident in our capacity and relentless in our commitment to one another. We have been there before, and we will get there again! Thank you. God bless each of us and may He bless all of Dutchess County and the United States of America.